In a world, where existence relies upon constant communication, the human race cries out for more. With BlackBerry in hand, we march towards a common goal; to augment our already amazing Smartphones. Staring at the vast world of BlackBerry applications, one must decide how they will choose. One application dares to state that it will make your “Smartphone smarter”. That application is Fixmo Tools. Comparing itself to a utility belt, Fixmo Tools seems to strive on the idea of prevention over apprehension. In other words, easily monitor important concerns such as; memory, battery life and email issues. It’s a great way to quickly draw attention to critical information when you might have forgotten something. Let’s see Fixmo Tools in action. If you are using an 88xx or 83xx BlackBerry, make sure you are running OS 4.5. The version I have currently is 1.02, which requires 818KB. For Storm users, it is recommended that you disable compatibility mode for optimal experience. This tool is the perfect response to “Oh no, no NO! I didn’t just delete that!” Fixmo Tools will bring you to a page that will display your most recently deleted emails, calendar entries, PIN messages, tasks and memos. This list is limited to the 50 most recent items, which are separated by date; much like your native Messages application. While this can be incredibly handy, Fixmo cannot guarantee to recover every piece of information. Attachments and emails over 2kb - that were deleted from the BlackBerry and the server - will not be recovered. Fixmo works quite well with the native BlackBerry calendar but, understandably, it will not work third party calendar applications. 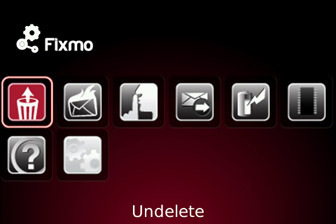 Undelete can be accessed through the Fixmo Tools menu or from the menu in your messages folder. Offensive Words: not everyone wants to read the f-bomb when checking their email. 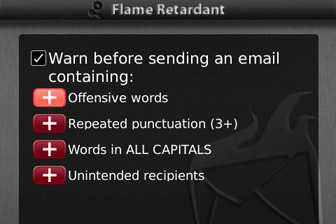 Fixmo Tools allows you to set up warnings if your email contains a naughty word from their “standard list” or words of your own. Repeated Punctuation: Yes I understand your excitement after you closed a big deal you’ve been working on, but it’s not really professional if you use three exclamation marks in your email. This feature warns if you use 3 or more “!” or “?” in your message. Words in all capitals: I DON’T KNOW ABOUT YOU, BUT I REALLY HATE READING EMAILS THAT LOOK LIKE THIS. I DON’T LIKE ALL OF THIS SHOUTING. IS IT NOISY WHERE YOU ARE EMAILING FROM? ARE YOU REALLY, REALLY ANGRY? THIS FEATURE WILL RECOGNIZE IF A GROUP OF 3 OR MORE WORDS ARE ALL CAPITALIZED. Unintended Recipients: “No I wasn’t talking about you sir, I was talking about my friend’s boss whose name is also Mr. Smith, who also works for us.” A warning will be given if your email contains a new domain in a reply or forward or if the email you are replying to wasn’t directed at you specifically (you were BCC’d). There’s nothing like your BlackBerry going off in the middle of a very important meeting. This feature will hush alerts for incoming calls during calendar events that you have marked as busy. I discovered that this can be ignored if you type “nosilence” in the location field. 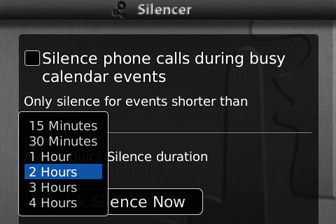 This feature also allows you to set a quick silence option, that can last between 15 minutes and 4 hours. This quick silence option can also be assigned to one of your convenience keys. This feature is actually accessible from the messages folder and is my favourite so far. You can edit the original message before you reply to it or forward it. This is a great way of sharing only pertinent information with other recipients. This feature does not allow you to forward attachments so easily however. You have to save them first, then reattach later on. Yes, your BlackBerry will easily display your power level at the top of your screen, but it doesn’t tell you much about your battery. From this feature, you can manage your connections (network, WiFi, etc) and view details. 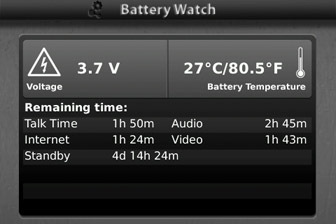 These details include: voltage, battery temperature (c and f) and estimated remaining time (you are able to see the remaining talk time, audio/video time, standby time and Internet time). 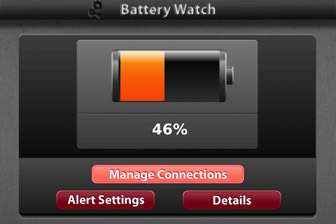 You can also choose to be alerted when your battery level drops below a certain level. Multiple alerts can be set up, allowing you to be notified when it drops below 50%, 25%, 15%, 10% or 5%. I wish I had this for my brain. This feature offers two views; the first will actively display the percentage of RAM and Device Memory made available, not the total memory. The details section will use a pie chart (mmm…pie) to show how the memory is currently being allocated and where. 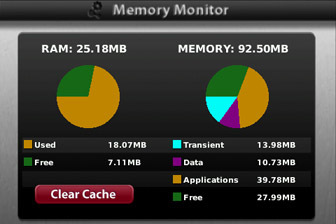 Fixmo Tools also included a handy Clear Cache button in order to recover as much memory as possible. Fixmo Tools is one of those applications that, once set up, will add some much needed functionality, especially with the Flame Retardant and Forward/Reply with Edit features. It’s those things that you don’t necessarily think about, until you realize it, that make the difference. The more you can automate, the more you can accomplish. Fixmo Tools is on the pricey side, with a price tag of $19.99. They do offer a 15 day trial period to help you decide if this application is for you. Save $5 on Fixmo Tools: CRACKBERRY READERS can always save $5 on Fixmo Tools when they purchase it via the CrackBerry Mobile App store or on-device client and use coupon code CBROCKS at checkout. Visit crackberry.com/getfixmo for full details.